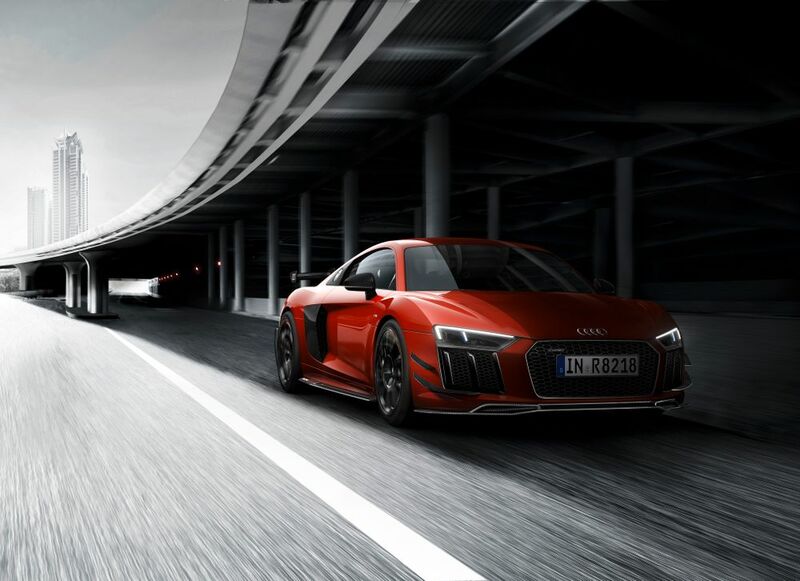 The current Audi R8 V10 Plus is already one of the fastest cars on the planet. Thanks to having 610 hp from its 5.2 liter naturally-aspirated V10, it can rocket to 60 mph in 2.8 seconds. That’s hypercar fast. It’s also quick around a track, thanks to its rear-biased Quattro all-wheel drive system. But what if you want something a bit more extreme, something with more of a bite? 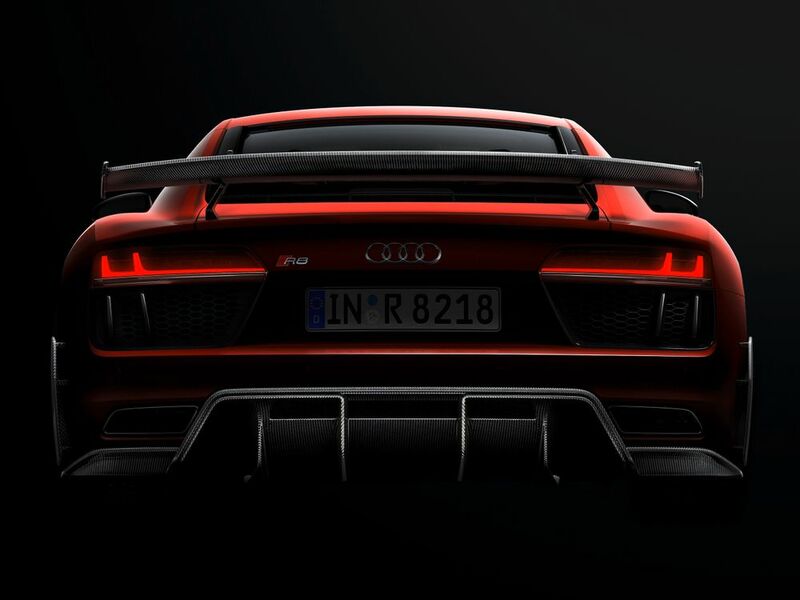 Well, Audi Sport has something for you and it’s absurdly named the Audi Sport Performance Parts R8. What is the Audi Sport Performance Parts R8, you might ask? Well, it’s essentially an Audi R8 with Audi Sport Performance Parts. That might sound silly but it’s the truth. It’s basically an R8 that’s been given many of the same Performance Parts you can buy on your own. Still, it’s pretty cool. So it starts with some added aerodynamics, such as a massive fixed rear wing. It also gets some front cannards, a lower front lip and a massive rear diffuser, all of which are made from carbon fiber, of course. All of that aero, by the way, is capable of exerting 100kg of downforce at 205 mph and 52kg of downforce at 93 mph. It rides on 20-inch lightweight wheels, finished in black, which apparently shave 8kg, and Michelin Pilot Sport Cup 2 tires, the best in the business. It also gets a three-way manually adjustable coilover suspension kit, which helps keep it livable on the road but rock hard on the track. Its carbon ceramic brakes get titanium backing plates and newer brake pads. Inside, it gets a ton of Alcantara, including the steering wheel, seats and basically everything else. If you want one of these special edition Audi R8 Performance Parts cars, you’re going to have to act fast. Audi is only going to be making 44 of them and it’s going to cost $234,000. You can also only get it in Misano Red. Honestly, that’s a bit too much money for this. We adore the Audi R8 and it’s one of our favorite cars but, at that price point, you’re better off spending the extra money and getting a Lamborghini Huracan Performante. Not only will you be getting the better car but getting something that will hold its value better. Sure, it’s almost $40,000 more but it’s the better car. This Audi R8 Performance Parts car looks great but you can buy a standard R8 and add Performance Parts for far less. Which to Buy: First-Gen Audi RS5 or Second-Gen Audi RS5?